The third guest post by graduating V&A/RCA History of Design students sees Joanne Pilcher put a fresh spin on the meaning of ‘ibid’. The term ‘ibid.’ appears extensively in the twenty-six 30,000-word long dissertations graduating students have written. When every word of the dissertation counts, this handy abbreviation saves precious words for formulating your own ideas. 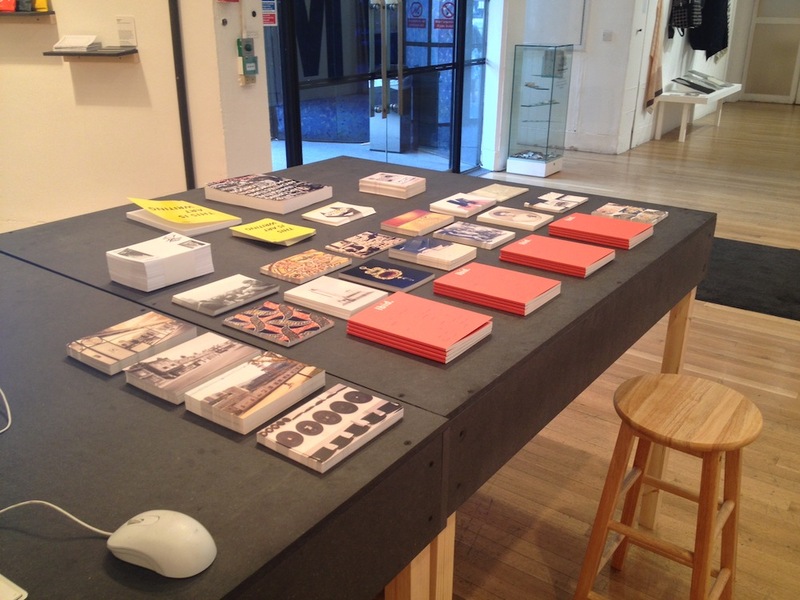 This year, in recognition of our collective debt, we’ve titled the V&A/RCA History of Design publication ibid. 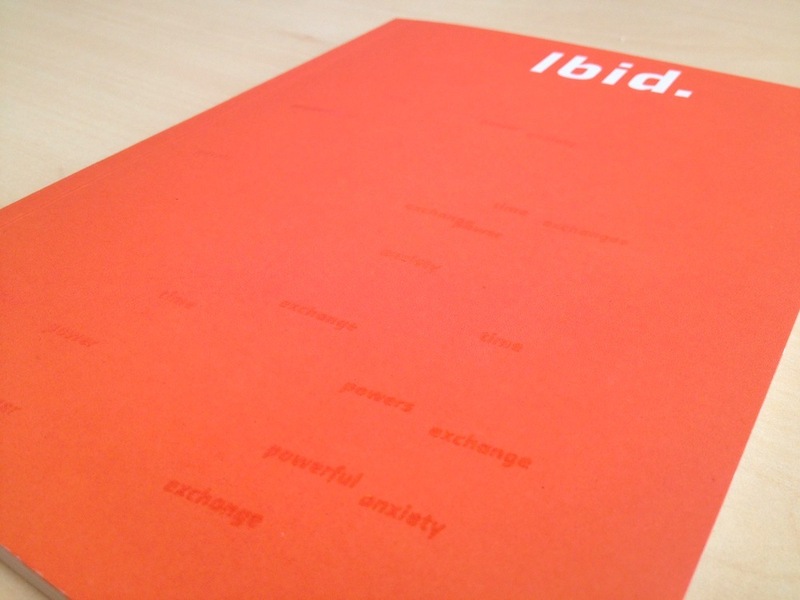 With ‘networks’ the overarching theme for this year’s Show, Symposium and publication, the idea of ibid. accrued new meanings for us. Its Latin root-word, ibidem, means ‘in the same place’, interesting because the vast array of our dissertation topics originate from the ‘same place’. In the first term of the first year of our MA, we were taught together. 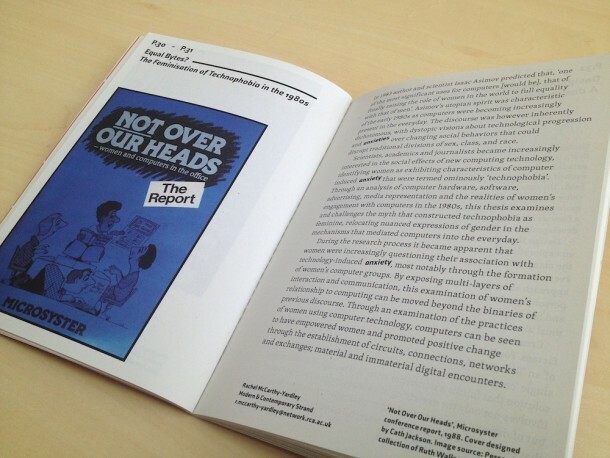 From here – learning the essentials of our discipline in one place – we have branched out in many different directions, while also remaining in dialogue with and inspiring each other to build on or question what we were taught in that first year. To bring together our diverse projects, the publication picks up some of the themes used in our ShowRCA exhibition and Symposium: Time, Power, Anxiety and Exchange. Each graduating student was asked to respond to one of these key concepts (also the title of one of our core first-year modules), reframing their dissertations accordingly. What was most exciting about this process was the opportunity to rediscover both my own and other students’ work through fresh eyes. For some, it was an opportunity to revisit their dissertation from a new perspective; for others, it was simply a chance to reflect on a year’s work. We were also keen to put our work in the much wider context of our discipline, approaching well-known names in the field to comment on the past, present and future of History of Design. Dr Christine Guth, acting Head of Programme for this year, wrote an introduction that encapsulates the Show team’s exhibition plans by discussing the mind map that was on display in one of the V&A’s seminar rooms. 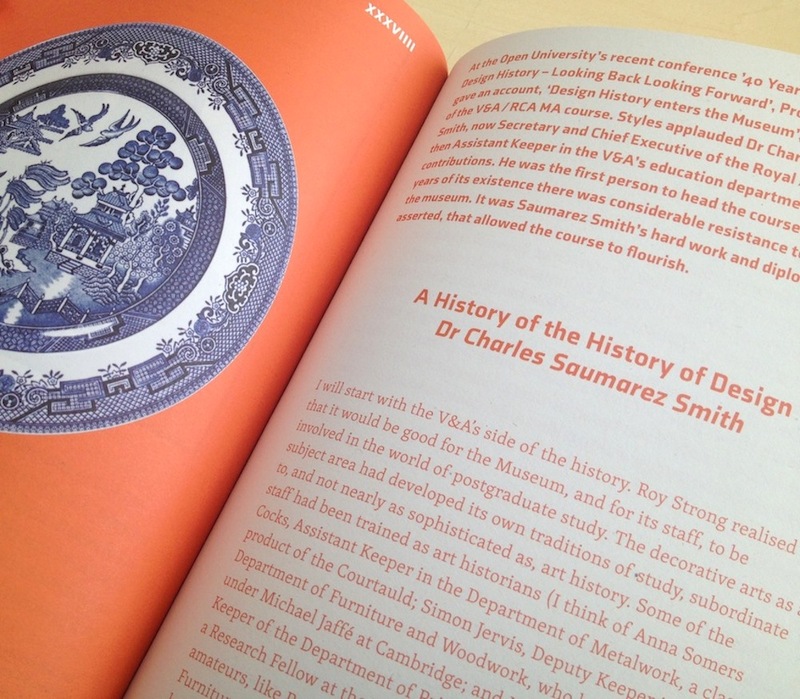 Our ‘centre-fold’ was Dr Charles Saumarez Smith, Chief Executive of the Royal Academy of Arts and one of the founders of the programme, who wrote a history of History of Design. Dr Sarah Teasley, Head of Programme at the RCA, has the last word with an essay that looks forward to History of Design’s future. Research and writing can be lonely, making the opportunity to work on a group project especially rewarding. This spirit of collective activity extended beyond History of Design to our collaboration with Ran Faigenboim, a first-year MA student in Visual Communication, who designed the publication. Ran’s design stresses the interconnected content found in the publication, and in our Show and Symposium. This interrelation is apparent from the cover, where our four key words – Time, Power, Anxiety and Exchange – are mapped to show their occurrence in the texts within. The publication in all its orange glory arrived at the V&A last week, and is available to visitors to ShowRCA and our Symposium at the V&A. 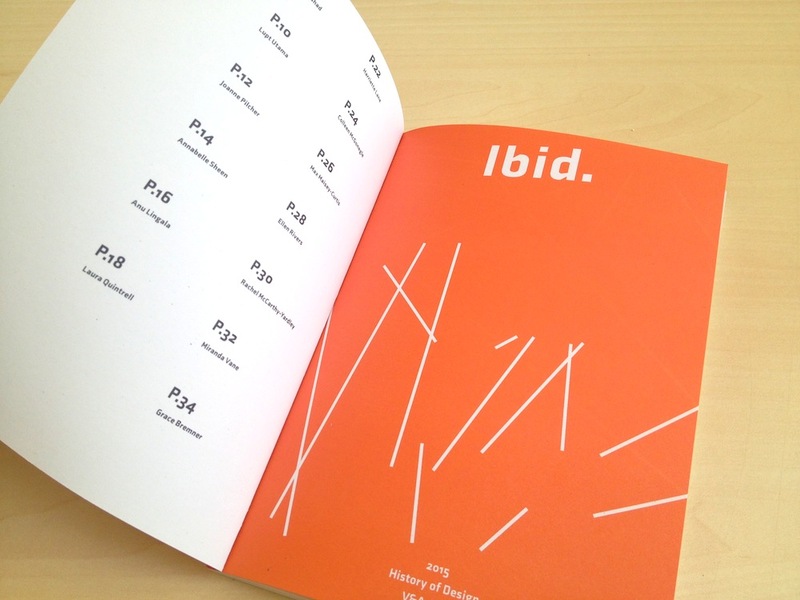 Pick up your free copy of ibid. at ShowRCA Kensington. We are open 12–6pm daily from Thursday 25 June to Sunday 5 July, with late opening to 9pm Wednesday 1 July (closed Friday 3 July). We’d also love to meet you if you’re considering studying History of Design. The V&A/RCA History of Design Programme holds a special Open Day on Wednesday 1 July, which begins in the Humanities Show space at 3pm, before moving to the Humanities Seminar Room. For more details about how to find us, see here.